Hillbilly John and I live in New York and we were looking for a place near by to prospect. We had found a place up in Vermont that is a known site that has gold. It is Buffalo Brook at camp Plymouth. 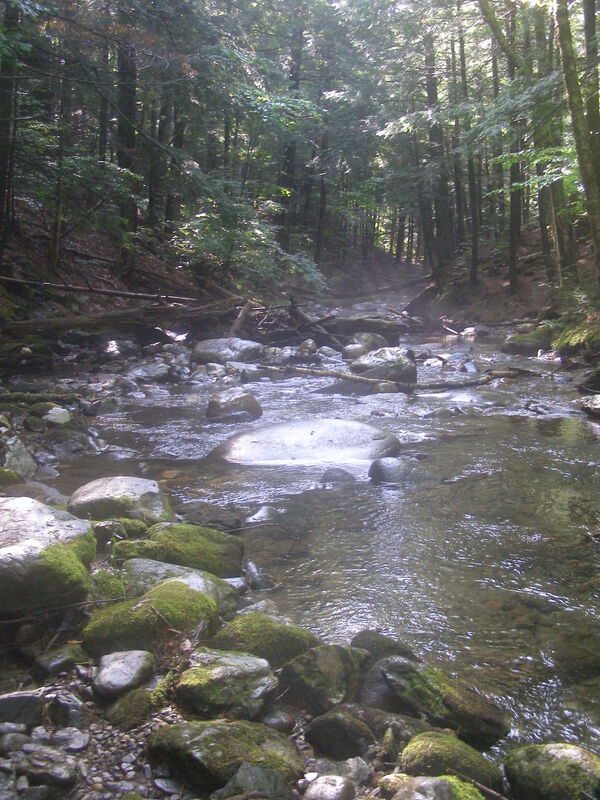 We had found out in our research that there was once an active Gold mine on this brook. We located the place on the map and figured it would take us a few hours to get there. We found out that in Vermont you may not use any kind of motorized equipment , electric or gas, such as highbankers, dredges or any kind of automatic spiral type pans nor can you use a sluicebox, it is limited solely to panning. So we decided to check it out, we went the weekend after labor day this was now the off-season and camp Plymouth was actually closed but you were still allowed on the property. We had all our gear with us shovels of various sizes, several 5 gallon buckets, sieve for classifying material,gold pans, tweezers, viles to put our gold in, all our camping gear and food. It was over cast the whole way there but it was a beautiful ride non the less,the Green mountains were breathtaking. We were hoping for it not to rain. We arrived got out our backpacks loaded with the equipment we need and we set out to find Buffalo Brook. We located a hiking trail that led us to the brook and it followed right along side the brook. We located a nice looking spot to get started and as we were getting our gear out it started to rain. We weren’t going to let a little rain stop us, we broke out the ponchos and put them on. We dug some material from the stream bed and ran it through the sieve to classify it that is to say remove the bigger rocks from it. When you do this you always look in the sieve which is called a classifier, for any gold nuggets that may be in there before you discard it. We did this procedure untill the 5 gallon bucket was almost full. We then proceeded to pan this classified material. It wasn’t easy with the rain splashing down in the pan. We had panned all of the classified material from the bucket and found nothing so we decided to move upstream. 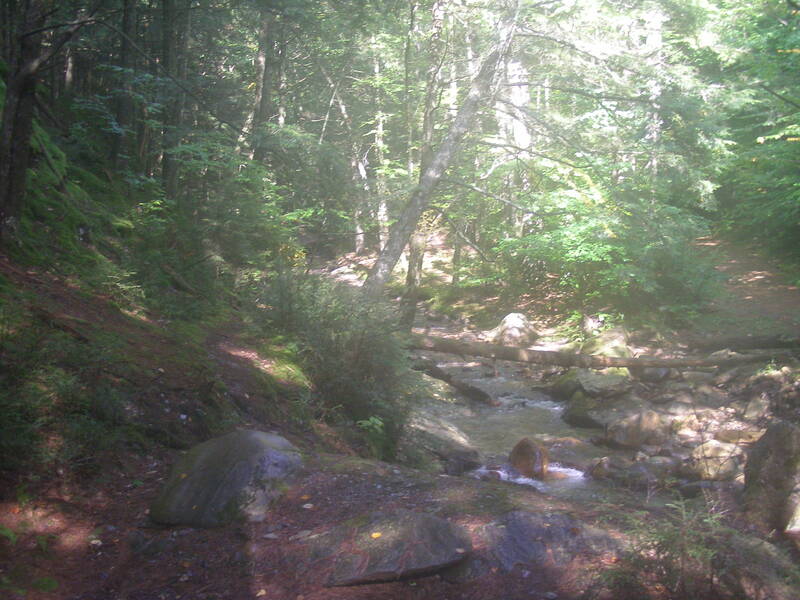 we hiked up this trail that looked like an old road and it criss crossed the brook several times. We noticed a depression in the side of the hill to the left of the trail and we went to investigate. It was the remains of the mine. The adit (the entrance) had been filled in but there were remains of the tracks that went into the mine. We knew then that we were in the right place. We went back down to the brook and we went to work we panned another bucket or two and it was starting to get late in the day we figured we better find a place to set up camp and of course it was still raining but letting up a bit. 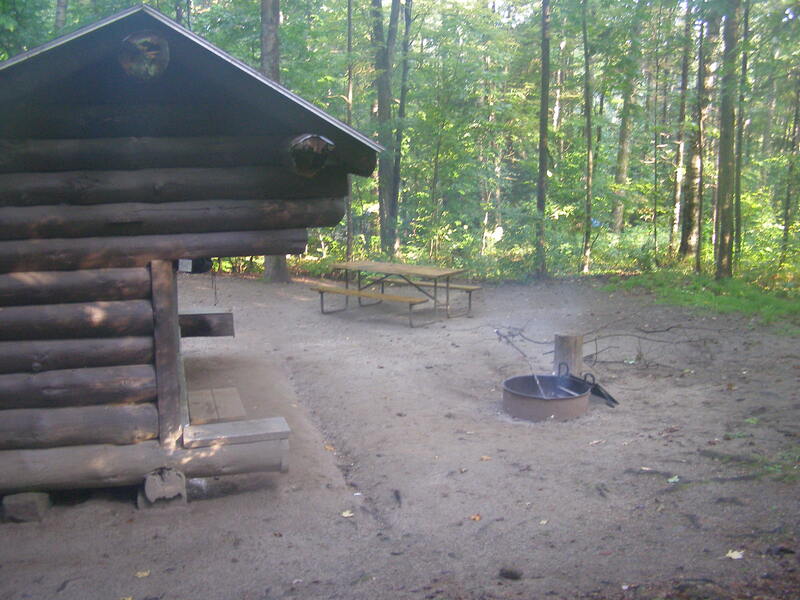 We headed back down to the car and we thought we may be able to stay at camp Plymouth. We found the care takers of the camp and asked permission to stay we were told no but they directed us to nearby Coolidge State Park which had a campground. We went over there and we rented a really nice lean-to. It was now getting dark but at least the rain had stopped. We made a fire which was not easy with wet wood and Hillbilly John cooked us up some grub, It was delicious. Theres just something about cooking over an open fire that makes anything taste great. We turned in for the night. I slept like a baby, Hillbilly John on the other hand didn’t sleep so good he had accidentally grabbed a child sized sleeping bag and he had a hard time getting comfortable with that. We got up the next morning and the sun was coming out, we had some breakfast and we headed back to camp Plymouth for some more prospecting. We hiked back up the trail to a spot we had been working the previous day. I figured we had probably leave around 1pm we both had to work the following day. We had panned all morning I found nothing but Hillbilly John had found a grain of sand sized piece of gold. I know that’s not much but we sure had a great time. That was worth every bit of all we had invested. Just because we didn’t find much at all doesn’t mean that it is not there I personally feel that it is a place worth checking out again and I will. Also while talking to one of the locals we found out about another mining location and it is located on the Coolidge State Park property it was a place called Five Corners it is a gold mining ghost town. I am going to return there and test pan that area.